Content can be repurposed, adapted and stretched across platforms. A story can start in one medium and finish in another. How are audiences moved between platforms, and how can one make this traversal a part of the entertainment experience itself? This paper provides an introduction to multi-platform and multi-format entertainment and then outlines the factors that influence cross-media interaction design. What is to be considered when designing for movement between platforms? How are audiences moved between platforms? What influences the choice of traversal? 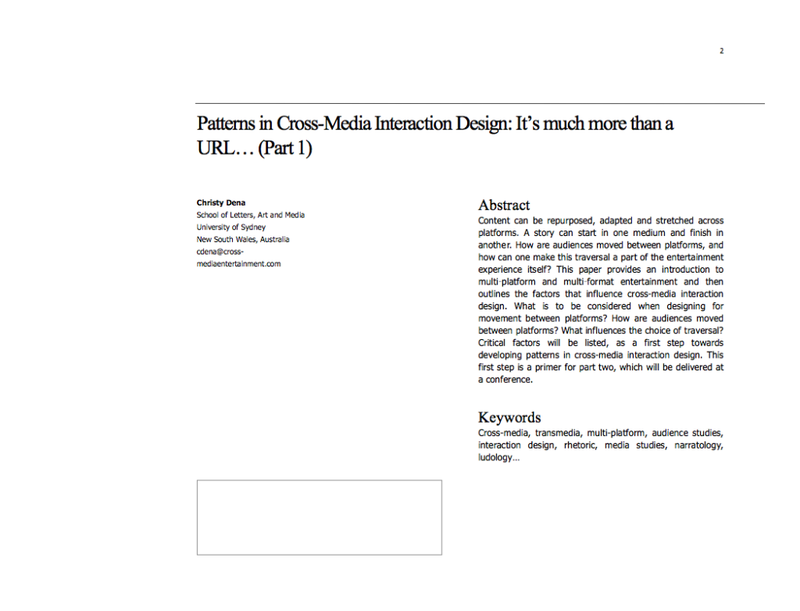 Critical factors will be listed, as a first step towards developing patterns in cross-media interaction design. This first step is a primer for part two, which will be delivered at a conference. Note: I am currently developing a Cross-Media Design Kit drawing on these insights and more I have discovered over the years. Posted on 2007 by admin. This entry was posted in > Articles, (Selected) Non-Fiction Writing & Resources. Bookmark the permalink.